This won't be a long post, as it has been a long day. 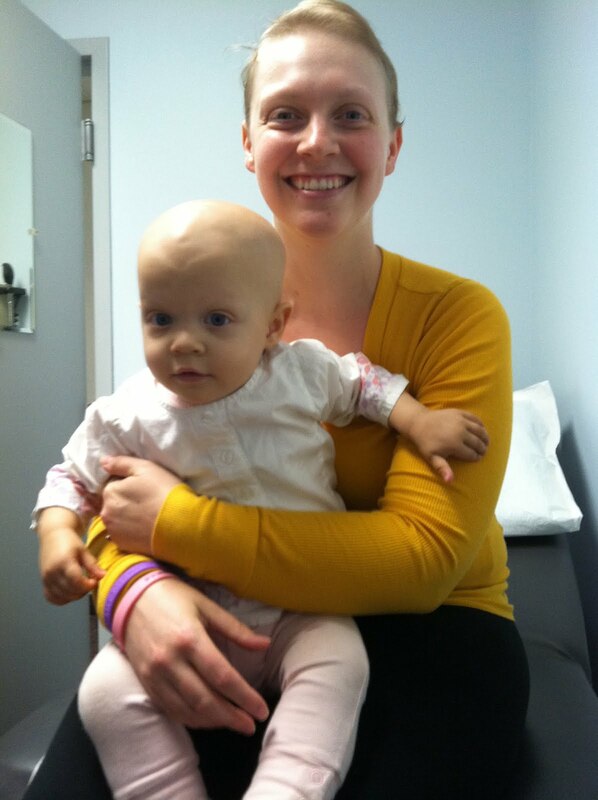 However, Saoirse is making great strides in her healing. The teams here are impressed with her progress, and she is getting better each day. She ate more today, including some squash, some cheese, and her loved goldfish. She is drinking formula and pooping and peeing like a champ. We did a little "physical therapy" today and had her lifting her legs to reach a toy balanced on her toes. She stood up a few times, taking just a couple steps, but when I brought her to the train table in the play room, she walked around playing trains as she loves to do. She is wobbly, as she is not yet using her abdominal muscles, but she is determined, and is doing great! She is still on fracture risk because of the high dose of steroids she is getting for her lack of adrenal glands, but as soon as we go home, that will no longer be an issue. We will be starting her chemotherapy tomorrow, and hopefully we will be able to stave off such terrible mucositis this time around. I am pretty sure we will be back here in a week and a half or so, but there is always hoping. If I'm successful in raising her GCSF post chemo to boost her counts faster, hopefully any mucositis she gets will be shorter in duration. Fingers crossed. Hopefully we'll be going home Friday afternoon. I can't wait! I am humbled and inspired by your courage and perseverance. My baby girl was recently diagnosed with cerebral palsy and as a parent it is a helpless feeling at times. But then I realize I can do everything in my power to get her the best care and show her I have faith in her and what she can accomplish. Your daughter sounds like a fighter and a survivor which will serve her well in her journey through this. Thoughts and prayers are with you and your family. your Princess is just gorgeous!! I will keep you and her in my prayers!!! :) Sending my love hugs and kisses from Houston Texas!! I just read your story on CNN and my heart just ached, but I am so glad you are positive and upbeat. I was diagnosed with Hodgkin's Disease at the age of 15 and beat it with radiation therapy. Twenty years later, I have been fortunate to not have a relapse and am blessed with a four year old daughter, so I can certainly relate to a portion of your situation. I just wanted to let you know, I will be praying for you and your beautiful family. Place your burdens on the Lord, He will get you through this! God bless you! When my nephew was 3-months old (this was in 1992), he was diagnosed with leukemia. He went through 6 months of chemo and was then transferred to Seattle to have a bone marrow transplant. Luckily, his 4-year old brother at the time was a perfect match. The team of doctors in Seattle told my sister and brother-in-law that there was less than a 10% chance that the bone marrow transplant would be of any benefit and they highly suggested that we not put either of the boys through the transplant. At that point, my nephew was 8-months old, and the team of doctors said he would not see his 1st birthday because no infant had ever lived through this type of chemo. It was an extremely difficult decision to make, but my sister simply could not let her child die without trying, so we proceeded with the bone marrow transplant. Well....the doctors were WRONG. I am happy beyond any words I can express to you that my nephew will be turning 18 next month and is beginning his senior year of high school. Through the remarkable team of doctors (even though they were wrong! ), and through numerous, numerous prayers, my nephew is and has been cancer-free for over 12 years now!! (I don't know if it has changed, but at that time they did not consider you to be "cancer free" until you had been in remission for 5 years.) Never, ever give up on your beautiful baby daughter. I truly believe that one of the many reasons my nephew made it was because he was an infant/toddler when he was going through all of this, and didn't know he could "give up"....he just kept fighting it. I know in my heart that the same will be true for your beautiful daughter. I am praying that you are both in remission very soon...and will be saying those wonderful words of "cancer free" in the near future. God bless you, your daughter, and your husband. I'll be praying for your family. I am in no place to give you encouragement nor share relational stories, because I have never been your position. However I would like to say that your story has touched me this morning and puts things into perspective with family and God. I think it's events and stories like this that serve as an inspiration to the world. See this event in your life as God's way of making you an instrument to show the world how appreciative we must be to others and for the life we have. You and your family serve as an inspiration to the world. My prayers are with you and may God take your family to a full recovery. Mike, hold on man. It's a tough roller coaster of life. But when the ride is over, you will look back and smile and say to yourself that you were the perfect Husband and Father. The story of your life is beautiful! This struggle! I am very happy to know that she's okay, I feel like part of the family! It'll be okay, you can be sure. The look is very reminiscent of my daughter Saoirse. God is watching you, you can be sure. Just wanted to let you know that I am following your story and am praying that all continues to go well. I just wanted to let you know that I am supporting you from the bottom of my heart.. I don't know how you do it with little one on hand try to care for her and care for yourself. Please stay strong and god will award you with a lot more blessing!!! I just want you to know that I am praying for you and your daughter. I saw your story on CNN and was inspired by what I read. I am sure there are unimaginably hard days. I am a new mom with a 6 month old baby and my heart goes out to you and your family. You and your daughter are beautiful and I am praying for fast recovery for both of you. Thank you for your courage and strength. Hug my daughter and think of you and your family nonstop since I've read about you. I can't even begin to imagine what your family is going through. Athough I am sure you have investigated all possible hospitals and the best paths of treatment for your daughter, I hope you have really and truly considered Memorial Sloan Kettering. I had my Stage IV high risk (Nmc amplified) child at Boston Childrens as we are from Weston. Upon further investigation, learning about the Band of Parents, Dr. LaQuaglia "the most amazing surgeon in the world" and the fact that not only are they the farthest along in NB research, they also treat more NB patients than any other hospital- and there is a real reason for that. The team and treatment we have experienced has filled our "cancer hell" with hope, new options, and a flexible roadmap and every changing turn. They are the only hospital that does SIX sites in bone marrow biopsies instead of one or two; allowing them to catch early relapse. They humanized version of their 3f8 therapy , an amazing treatment that helps the body to attack NB cells on its own and is only available at MSKCC.MSKCC does not use stem cell transplant- stem cell rescues when counts are low after high does chemotherapy and special other protocols. It is why they treat more children than anywhere else in America. I loved Dana Farber/BCH but was astounded at what we had been missing out on when my child was evaluated for treatment at MSKCC. And last but not least, the founders of Band ofParents, a Sloan Kettering Family, have started an additional foundation called Cookies for Cancer. It has been incredibly successful and the money raised goes not only to MSKCC but anywhere that has clinical trials that may benefit NB patients. They have recently been featured nationally on the news as well as in Woman's Day and Family Circle Magazines. I know that CHB is an incredible place. My daughter was treated well there, and there was fantastic staff, but not the resources available at MSKCC. I urge you to call Dr. Modak (our favorite!) or any of the physicians above for another evaluation. All chemotherapy can be done at home hospitals, but in order to be eligible for trials certain protocols must be followed. I am so pleased for your remission and I hope this information is helpful; it is certainly not meant to be preaching. The NB community and BOP will be praying for you. Thinking about you and Saoirse and looking forward to reading about Saoirse's return home and continued recovery! As a new mother myself, it pains me deeply to know what you all have had to go through. God bless your family and your beautiful baby, Saoirse. Stay strong and positive always! been following your story for a couple weeks you are in my prayers. god bless you and your beautiful little girl.